I must humbly confess, I have not always had a green thumb. I killed every single plant I brought into our Boston apartment on Beacon Hill when we were first married. 15 years later, I know what I did wrong: I over watered them. You will kill more houseplants from over watering than you will from under watering. Gardening outdoors taught me how to garden indoors. Many of my houseplants are simply plants I like to grow in my garden, but they are not hardy in my Wisconsin Zone 5 and cannot stay outside during the winter. Houseplants offer a variety of benefits. They look great; they clean your air for free, providing everyone with a healthier living space; they help add humidity to a dry winter house; and they give you something to care for, which makes one feel better. Foxtail Fern, Asparagus Fern, Boston Fern, Elephant Ears, Cordyline, Peace Lily, Coleus, Banana Plants, Sweet-Potato Vine, Jade Plant. Houseplants love to be outside in the summer. You can move them outside when the nighttime temps are in the 50s and 60s consistently. Start by placing them in a shady spot, or they will get a sunburn just like we do if we lie in the sun all day after a long winter. Slowly move them into sunnier conditions. If they do get sunburned, don’t give up and discard them. They will bounce back in 3 weeks and remain strong, vital houseplants. I have sunburned many a houseplant to the point where they look completely dead with no hope of returning, but I let them be and continued watering and they always made a strong comeback. So never give up! Since I am green, I do not use any chemicals and I always start off with a good organic potting-soil mix. Never use topsoil or dirt, as it will harden like clay in a pot and kill your plant. I probably do not fertilize enough, according to textbooks or experts, but nature seems to take good care of my plants and they seem to be living a long and happy life. I sometimes add earthworm castings to my potting mix when they are outside for the summer, but only in the earlier part of the summer. 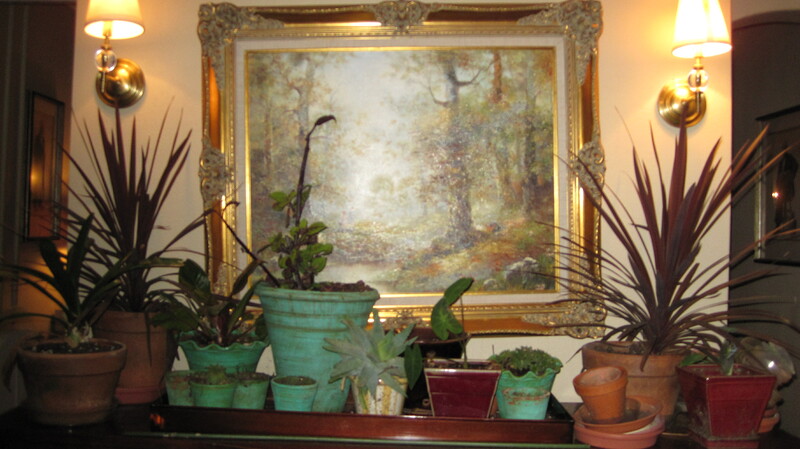 It is best to let your houseplants take a rest in the winter, by watering less and not fertilizing. Weeping fig and fatsia work day and night to remove contaminants from the air. Findings: Two common houseplants reduced aerial concentrations of volatile formaldehyde by 50 percent in two hours or less, according to a joint study by Korean and U.S. researchers. If you’re wondering ‘What does this have to do with me?’ you may be dismayed to know that formaldehyde is emitted from products found in most homes, including carpet, plywood, particleboard, curtains, and adhesives. Formaldehyde levels are several times higher in new houses than in older ones, the researchers report. Aerial parts of the plant–the leaves and stems–absorb the volatiles during the day: the root zone continues the work at night. Our advice: Take a tip from Stanley Kays, Ph.D., of the University of Georgia, one of the study’s authors, and place a houseplant or two in every room to improve air quality. Kays also recommends Boston fern and areca palm.